In November 2008, the Hallmark Channel aired the film adaptation of Lousia May Alcott's short story An Old-Fashioned Thanksgiving, becoming the highest-rated cable television movie of the week. Starring the beautiful, award-winning actress Jacqueline Bisset as Isabella, An Old-Fashioned Christmas picks up where Thanksgiving left off. Christmas airs tomorrow on the Hallmark Channel at 8/7c, and will prove to be a movie event that your family can't miss. 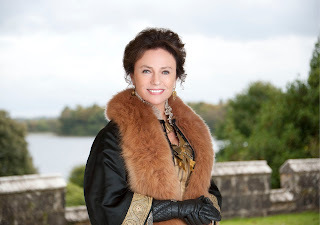 I spoke with Jacqueline about the movie, about revisiting the story of Isabella and her granddaughter Tilly, and their globe-trotting adventures that land them at Shannon Castle in Ireland. Celebrity Extra: When you first approached about this sequel, were you excited to learn that Hallmark was going to revisit your characters with An Old-Fashioned Christmas? Jacqueline Bisset: Oh, yes I was. I wanted to see what they did with it. And I got to work with Donald Martin, whom I’ve been trying to work with for quite a while. So that was good. CE: Also, were you excited just to be able to play the part of Isabella again, to explore what she has been doing these past few years? JB: Well I think, it’s a journey. There was a new actress (playing Tilly, Catherine Steadman), which was odd to work with a different actress in the same role two years later. But actually it worked out just fine. Once I realized she’d grown up in those two years, I was able to wrap around her emotionally as I felt I had in the first one. I attached to her and felt fond of her. But it was a little bit brutal the way she treated me in this one. We were in a more argumentative stage in our relationship. And my controlling character was having difficulty keeping her in what I thought was the right thing for her. I think my character had good instincts about her granddaughter, but I think she is controlling and interfering, and certainly felt that that it her responsibility, being responsible for her young charge. CE: That leads right into the next question about how Isabella can be stern and a bit unbending — it must be difficult because she really has Tilly’s best interests at heart. JB: It’s really Isabella's change. My character's change is not that really that different, but Tilly's reaction to me is different. When she meets me on the farm, she’s full of her anger of her past situation with the rest of the family. And she’s rather enthralled by my free spirit and my style, and what she sees as being a worldly quality in me. I’m sure it is inspirational to her and her desire to be a writer. We’re very close. But she’s also seen the other side of me, which is suffocating to her. And she knows my reputation through her mother. She feels that that relationship was not the truth about me, and she knows me better than her own mother does, in fact. I’m able to communicate with Tilly better than with my own daughter. CE: It is funny, because a lot of the time that really does skip a generation, as Isabella couldn’t understand Mary, but she gets Tilly. JB: Definitely. Love is complicated, as are relationships. But I think Isabella has insecurities. I think she’s had a hard life. When Lady Shannon and these grand people start criticizing her family, she takes it very personally. She feels that she has overcome her own class issues to some degree, but when she’s now facing the aristocracy, she’s still faced with the aristocracy of her background. She doesn’t want to be insulted and neither does Tilly. Plus, she knows that they’re after Isabella’s money. CE: Isabella and Shawn (above) have some great chemistry. How was it working with Ian McIlhenny? JB: He was lovely. It was lovely. This character has got so little romance; it’s all about other people’s romance, so I guess they were wanting me to have a little romance. CE: The movie itself is so lush and beautiful. How was this filming experience? JB: Very nice. We were in County Clare in Ireland, and we were shooting in this castle. And my hotel was a castle. It was a short shoot, but it was a pretty intense shoot. The hours in Ireland are not as bad as they are in America. So it was bearable. And all the actors were lovely and the director was lovely. It didn’t rain, hardly at all. It was really quite a special shoot. The food was good; it was a heavy sort of English/Irish-style food, which I love, I must admit. It’s absolutely disastrous to the waistline, but I thoroughly enjoy it. And I got to work with Joel Rice, who is the producer, on the first one. He’s really someone I like working with, and he takes care of his group in a paternalistic way, which was really pleasant. So, I felt quite good. CE: And just from a purely “girly” point of few, it must be terribly fun to get to dress in those gorgeous period dresses. JB: Yes, but it’s absolutely murder if you try tightening up the corset. The thing is with period pieces, is you don’t want to take the corset off when you’re eating and then put it back on and tighten it, because you just feel you’re absolutely terrible. The corset thing with food is not fun. Because once you start digesting with a tight thing around you, it’s not a good feeling. And plus, you’ll get overwhelmingly sleepy if you are not careful. And I fall into every trap that I’ve ever known about; I fall into it again when I see good food. I’ve been through this in Anna Karenina in Hungary, almost passing out after meals when I couldn’t take it off because there was no time to take it all off and undo one’s hair. So, I was absolutely comatose after lunch, as I was on almost every period film I’ve ever done. And I’ve learned my lesson that I can’t resist. It’s trouble. I’m weak in that situation. Really, really weak. CE: That’s just something I would never think about because I’ve never had to wear a corset, but I guess you would have to be careful. JB: You do. And you’re supposedly trying to keep your energy going. The only period film which I did not have a corset in was Napoleon and Josephine, because of the Empire line with the waist up underneath the bust. And one could eat freely and I have to admit, they ended the film and I thought, “What is this thing following me around?” And I realized it was my bottom! I literally lost track of my body during the shoot, because I didn’t have anything to measure it against. I didn’t have to get into any tight jeans or anything. Everything was loose. CE: One thing that I really like about the Hallmark Channel is they are creating these movies that are big-screen quality for the small screen, which you can enjoy with the entire family. Was that something that appealed to you? JB: I had never thought of it quite like that. Yes, I do like making movies that are like that, but I just think that the content … It’s just out of control what people are making nowadays. I’m worried about the world, I have to say. I just think it’s becoming so lewd to some degree. I just think, “Where is this going to go to?” It depresses me a bit. I like characters that have a bit of principal. I don’t think it’s boring; I think it’s still a good story. Nothing has to be so extreme or so violent. I’m for all different kinds of things for adults, but I’m glad there are still stories that have some romance about them. I see this story as kind of a fairy tale with some quite strong truths in it. JB: Well, it’s a Christmas movie in a sense of people coming together. I just hope that my character works and people are interested or amused or intrigued — or whatever it is the actor is to be doing — that they believe it. I think that the idea of a family joining together and getting over some past troubles is a nice idea. And eating around a table is always a good idea. People sitting together and being friendly is one of the best things in life. That’s where we all sort of want to end up, entwined emotionally and with warmth and with the luck to have something on the table to eat. I just think those are the true values of the joys of life. Because they all work so hard in so many different ways, if you don’t have those comings together, I just don’t think it means as much. The fight to have stuff and the endless commercialization of everything, it’s just not a good way to live. I hope when people see this film, they sit together and feel closer.